At the edge of its range in southern Lower Michigan, usually restricted to bogs and coniferous forests; northward, widespread in coniferous, deciduous, and mixed forests on sandy and richer soils; particularly luxuriant under cedar and in birch-fir forests near the Great Lakes. The margins of the leaves are ciliate with loose fine hairs, glabrate in age. 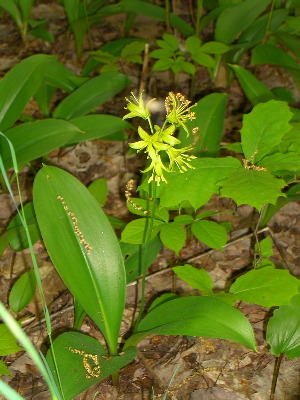 The leaves, often conspicuous in the forest understory, may thus be readily distinguished from those of similar plants. MICHIGAN FLORA ONLINE. A. A. Reznicek, E. G. Voss, & B. S. Walters. February 2011. University of Michigan. Web. 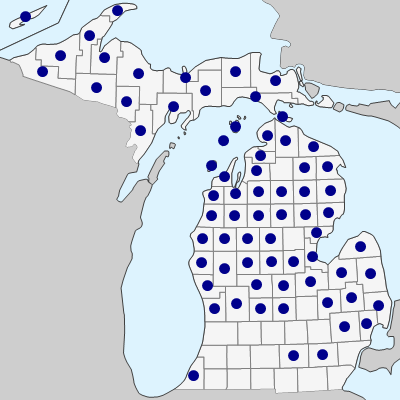 April 25, 2019. https://michiganflora.net/species.aspx?id=827.